The Greenway 500 Bike Shop is adjacent to the Cardinal Greenway at the Medford Trailhead (500S & Hwy 35 - map), minutes from downtown Muncie. At the new shop in East Central Indiana, I look forward to serving you, and servicing your bike to enhance your enjoyment and propel your performance. Why Come to Greenway 500? I have more than 20 years of experience, and am committed to keeping up with changing technology. This makes me your number one choice for expert bicycle service. 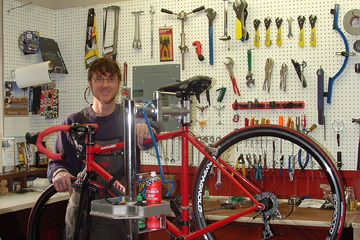 I gained experience in repairing, building and tuning bicycles in Memphis, Tennessee, Worcester, Massachusetts, and Spencer, Massachusetts, where I was manager and head mechanic. Since moving to Indiana in 2005, I worked at the downtown Muncie bike shop until opening the Greenway 500 Bike Shop. Even though I have ridden, trained, raced, and pedaled across the U.S. five times, I probably still have more hours with a wrench in my hand than I have hours in the saddle. I will use that experience to give you superior service. Indiana Weekend - Episode 19 - a cool interview with Mike O'Neal about his biking experiences. Greenway 500 Bike Shop is proud to be the Newest, Finest, Absolute Fuji, Kestrel, and Breezer dealer in East Central Indiana. (Newset, Finest, and Absolute are just three of Fuji's models).